They grow up fast, don’t they? I’m not even talking about my own boys, who are eating me out of house and home with their darn growth spurts. I’m talking about the other youngsters growing up on my property — the birds, or course. 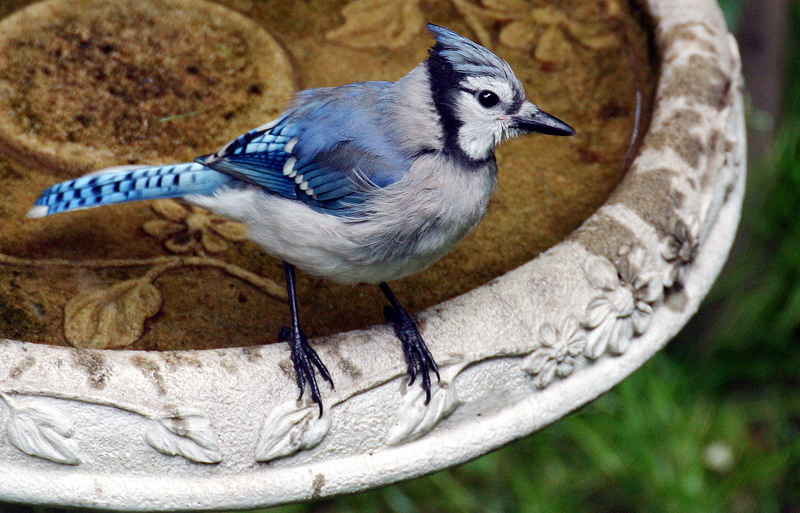 Watching the activity at the birdbath recently has been an education in just how quickly birds grow. I was watching a blue jay the other day and it took me a while to realize the bird looked a little different from the blue jays I was used to seeing. Mostly around the face, the bird just didn’t look right. It was a youngster, or a fledgling to be more scientific. It doesn’t take long before young blue jays look just like their parents. It takes even less time before they are the size of their parents. This bird was in that short in-between phase when it was the size of an adult, but didn’t quite obtain the adult plumage. The juvenile plumage disappears quickly in most songbirds, unlike some other types of birds when it can take years. A bald eagle, for instance, doesn’t obtain its white head for four or five years. But in songbirds, it’s a matter of a few short weeks. The juvenile blue jay I watched tried a defense mechanism I’ve never seen from a blue jay before. As I approached the garden, I discovered the young bird sitting motionless on a fence near the birdbath. It remained perfectly still as I continued toward the garden. It was employing a freezing technique whereby birds try to avoid predators by sitting still, hoping the danger walks by without noticing. Other birds, such as bitterns, have mastered this technique. Bitterns raise their long necks and bills into the air and blend in perfectly with their tall grass surroundings. This blue jay, on the other hand, wasn’t fooling anybody. It was out in the open and already sporting bright blue feathers. As it gets older and wiser, hopefully it will learn other defense mechanisms. I’m confident it will. The lives of songbirds move quickly. A blue jay, for instance, is ready to fly a scant five weeks or so after the egg is laid. A little more than two weeks of incubation and a little more than two weeks before it fledges. A robin’s early life cycle is even quicker. They are ready to leave the nest after about four weeks. You have to respect the parent birds for finding so much food to facilitate the quick growth of their offspring. Leaving the nest quickly is advantageous for a few reasons. Primarily, it gives the parents time to start another brood and therefore produce more young to perpetuate the species. Robins can have three broods in a single spring/summer season. Leaving the nest early is also good for avoiding predators. An adult can sit quiet and motionless on a nest for days on end. Once the eggs are hatched, forget about peace and quiet at the nest site. The motion and noise coming from the nest puts the location at risk. Nests also harbor mites and other parasites, so the quicker the young birds leave, the better. Often, a bird will leave the nest even before it is able to fly. It will hop around the ground for a few days and seek shelter when necessary. That’s why it’s important not to touch young birds when they are found. They may appear to be abandoned, but they rarely are. A parent is likely watching nearby or will return shortly. I’ve also seen young cardinals, catbirds, chipping sparrows, mourning doves and lots of titmice in the yard this year. It’s amazing to watch them grow so quickly. What’s growing up in your yard? Drop me a line and let me know. This entry was posted in Baby animals, backyard birding, For the Birds column by Chris Bosak. Bookmark the permalink.